This study investigated the speech perception of cochlear implant (CI) recipients with measurable preoperative ipsilateral speech perception. These data should support improved individual counselling of CI candidates. Pre- and postoperative speech audiometric parameters were analyzed, including maximum score for phonemically balanced words (PBmax) and monosyllabic score at a normal conversational level of 65 dBSPL, with hearing aids one hand and CI on the other. Data of 284 experienced adult CI wearers were grouped and evaluated in terms of preoperative PBmax. The preoperative PBmax was exceeded by the postoperative monosyllabic score in 96% of cases. The overall median postoperative score was 72.5%. The groups with preoperative PBmax > 0% showed significantly better speech perception scores with CI than the group with PBmax = 0%. Median improvement compared to the preoperative monosyllabic score with hearing aids was 65 percentage points, independent of preoperative PBmax. The preoperatively measured PBmax may be used as a predictor for the minimum speech perception obtained with CI. This is of high clinical relevance for CI candidates with a PBmax above zero. 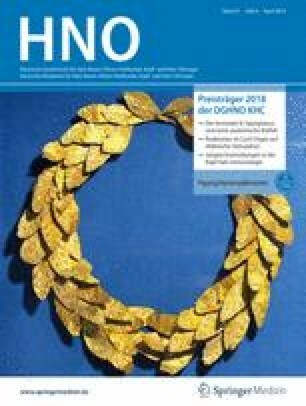 The German version of this article can be found under https://doi.org/10.1007/s00106-018-0605-3. Cochlear implantation is an established treatment for patients with severe-to-profound hearing loss up to total deafness . In the early years of treatment, only patients with functional deafness and no speech perception with acoustic amplification were considered as candidates for a cochlear implant (CI). In the past two decades, the audiological indication criteria have been widened considerably [4, 11]. Today, some candidates still have substantial residual hearing on the side to receive the CI. Concerning the contralateral side, hearing-impaired patients with all degrees of hearing loss down to normal hearing have successfully received an implant [1, 16, 20]. The reasons for this were the continuous improvement of CI treatment in surgery [19, 20], technology [2, 7, 8, 17, 28], and rehabilitation [26, 29]. Furthermore, an increasing number of subjects with significant preoperative ipsilateral hearing have been considered for cochlear implantation . For these candidates in particular, the individual prediction of postoperative speech perception with respect to the preoperative assessment is an absolute clinical necessity, as cochlear implantation may impair residual hearing [19, 20]. Various studies have been performed to investigate the factors influencing postoperative speech perception in large recipient groups [2, 8, 18, 29]. Blamey et al. , reporting on 2251 recipients, identified five main factors influencing postoperative speech perception scores in different ways: duration of severe-to-profound hearing loss, age at implantation, age at onset of severe-to-profound hearing loss, etiology, and duration of implant experience. The relation between preoperative and postoperative speech recognition was not discussed explicitly. This was presumably because of the multicenter and multilingual study design, which introduced inherent limitations for comparing speech scores before and after cochlear implantation. Closer examination of their data reveals a further limitation: Only a small proportion of recipients had preoperative monosyllabic scores of more than 0%. Holden et al. , reporting on 114 subjects, found a correlation between preoperative sentence recognition score and postoperative monosyllabic score. However, as with the study of Blamey et al., the mean preoperative sentence recognition scores were rather low, with most of the subjects scoring close to or exactly 0% with a mean of 16.4% ± 18%. In a multicenter study, Gifford et al. compared preoperative monosyllabic word (consonant—nuclear vowel—consonant, CNC) scores of 22 subjects in the best-aided condition with their postoperative CI-only and, if possible, bimodal scores. Their results, together with those of Holden et al., suggest that the better the preoperative speech recognition ability, the better the CI score. This finding has since been confirmed by various studies [3, 14, 18]. For hearing aid (HA) and CI evaluation in German-speaking countries, monosyllabic and sentence tests are mostly used . The Freiburg monosyllabic test plays a specific role; it is conducted with headphones within the standardized speech audiogram as well as in the free-field situation with HA or CI. This yields information about speech intelligibility at conversation levels and close to the discomfort level [15, 25]. Speech perception measures used in preoperative evaluations include the score for recognition of phonemically balanced monosyllabic words at conversation level of 65 dB with a hearing aid, Word Recognition Score (WRS)65(HA); another is the maximum recognition score for phonemically balanced monosyllabic words (WRSmax; also often referred to as PBmax). The latter is measured as a part of the performance-intensity function by using air-conduction headphones. The presentation level for WRSmax may vary between individuals, and—especially for higher degrees of hearing loss—it can reach values slightly below the level of discomfort . When evaluated together with the pure-tone audiogram, WRSmax allows for an initial assessment of the best speech recognition that can be achieved with acoustic amplification [10, 24]. For most individuals, WRSmax is higher than WRS65(HA) [12, 13]. Halpin and Rauch  discussed WRSmax in connection with the information-carrying capacity (ICC) of the auditory system. The WRSmax can be regarded as an estimator for the ICC. Halpin and Rauch emphasized that similar pure-tone audiograms may lead to different speech perception abilities. The pure-tone audiogram captures the attenuation component of hearing loss; other potential impacts of a cochlear hearing disorder, such as reduced temporal or spectral resolution, are not assessed. In addition to the pure-tone audiogram, WRSmax captures implicitly the impact of the reduced temporal and spectral resolution of the entire auditory system. Recent studies [10, 11, 15, 21, 22, 23] of hearing-aid users have reported a considerable proportion of users, even among those with moderate hearing loss, who were unable to convert their ICC (measured as WRSmax) into aided speech perception at conversation levels. This mismatch can be explained, at least in users with higher degrees of hearing loss: WRSmax is measured near the discomfort level . The insufficient dynamic range  of that group of hearing-aid users, together with their intolerance of the high acoustic amplification needed, limits the potential benefit of hearing-aid provision in those cases. The aim of this retrospective study was to investigate speech perception following cochlear implantation in subjects who had demonstrated substantial ICC as measured by a preoperative WRSmax above 0%. Therefore, speech perception scores of recipients with different levels of preoperative monosyllabic scores were compared. Furthermore, the value of WRSmax as a predictive factor for postoperative speech perception scores was assessed. A total of 550 patients had received a Nucleus cochlear implant (Cochlear Ltd, Sydney, Australia) in the ENT department of the University Hospital of Erlangen between January 2010 and June 2014; all of these patients’ files were reviewed. After excluding pediatric implantations, there were 312 adult subjects, each of whom had received a CI, either a Nucleus CI24RE(CA) (N = 208) or Nucleus CI512 (N = 104); these models have identical perimodiolar electrode arrays and function, but different receiver/stimulator housings. The implantation was carried out by cochleostomy (N = 81), by round-window insertion (N = 41), or by round-window enlargement (N = 190). Correct intracochlear electrode positioning was verified by postoperative imaging using either conventional X‑ray or computer-aided tomography. The cases were grouped according to their preoperative WRSmax score into three groups: Group 1 consisted of cases with a WRSmax of 0, group 2 had a WRSmax above 0 and up to 50% (inclusive), and group 3 had a WRSmax above 50%. Table 1 summarizes the statistical data for age and preoperative speech perception measures. Apart from WRSmax, which was measured by headphone, aided monaural monosyllable perception was measured in free field in a 6 × 6-m anechoic booth at 65 dB, WRS65(HA). The loudspeaker was placed 1.5 m in front of the patient (0° azimuth). The contralateral ear was masked appropriately with wideband noise presented through headphones (DT48; beyerdynamic, Heilbronn, Germany). All CI candidates had at least 3 months of HA experience. The last fitting process had been within the 3 months before audiometric assessment. Before measurements, HA function was checked technically by hearing-aid acousticians in the ENT department. In addition to the visual inspection and feedback provocation, it was ensured that the prescribed hearing aids provided sufficient amplification, corresponding to the individual’s hearing loss. With regard to the fitting, in cases where any problems were encountered, coupler or in situ measurements were performed in order to ensure sufficient acoustic amplification. The postoperative score with a CI for the Freiburg monosyllabic test at 65 dB sound pressure level (SPL), WRS65(CI), was measured 6 months after CI activation. The same audiometric setup as for the preoperative WRS65(HA) was used, including contralateral masking. The Matlab® Software R2013a (MathWorks, Natick, MA, USA) was used for performing calculations and producing figures. Since the speech perception scores were not normally distributed (p < 10−6 by the Shapiro–Wilk test) nonparametric analysis was performed. Group comparisons were analyzed with the Kruskal–Wallis test in combination with post hoc analysis. Individual pretest–posttest comparisons of speech perception scores were undertaken according to Holube et al. . Correlation analysis was performed using the Spearman rank correlation. The scatter plot in Fig. 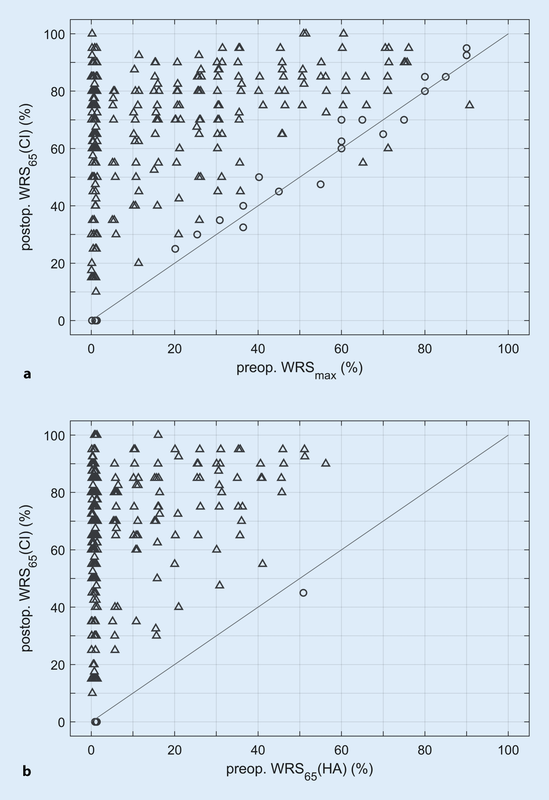 1 shows the relationship between the postoperative WRS65(CI) (y-axis) and the preoperative WRSmax (Fig. 1a) or WRS65(HA) (Fig. 1b). Points above the diagonals represent higher postoperative scores, and points below them represent lower ones. In Fig. 1a, points cover the entire area above the diagonal. The triangles denote significant changes at the individual level (as defined in ). Analysis of the correlation between preoperative WRSmax and postoperative WRS65(CI) was performed for all patients in groups 2 and 3. The rank correlation coefficient is r = 0.39 with p = 3.4 × 10−7. The majority (156; 96%) of the 163 CI recipients in groups 2 and 3 with a WRSmax above 0% had postoperative WRS65(CI) scores that were equivalent to or surpassed their preoperative WRSmax. However, seven recipients failed to achieve their preoperative WRSmax. Their audiometric data are displayed in Table 2. However, these subjects showed improved speech perception with the CI, compared with the HA score, at 65 dBSPL. The scatter plot in Fig. 1b shows 98% of the points above the diagonal, indicating improved speech perception at conversation level after 6 months of CI experience. Figure 2a shows the distribution of WRS65(CI) for the three groups as box plots. The median WRS65(CI) is 65%, 75%, and 85% for groups 1, 2, and 3, respectively. According to the Kruskal–Wallis test, postoperative WRS65(CI) differed significantly between the three groups, H(2) = 26.2, p < 0.001. Pairwise post hoc comparisons with adjusted p values showed that the median WRS65(CI) differed for all three groups (p < 0.01). Analysis of these differences for the groups did not reveal any statistically significant difference between the median values, H(2) = 0.105, p = 0.95. This means that all patients experienced a comparable improvement of around 65 percentage points at conversation level, independently of their preoperative WRSmax. The histograms in Fig. 3 show the postoperative monosyllabic score with CI for groups 1–3 (Fig. 3b–d). It is evident that the distribution character differs among the groups. For group 1 the distribution shows two peaks (Fig. 3b). Figure 3a shows corresponding results from Holden et al. for the CNC score of 114 postlingually deafened adults, measured 24 months postoperatively at 60 dBSPL. It is clear that the distribution of speech perception scores found by Holden et al. is most closely comparable to that of our group 1 (Fig. 3b). With a view to supporting the audiological part of the indication and individual counselling process for CI candidates, we investigated the predictive value of the preoperative maximum speech recognition score. 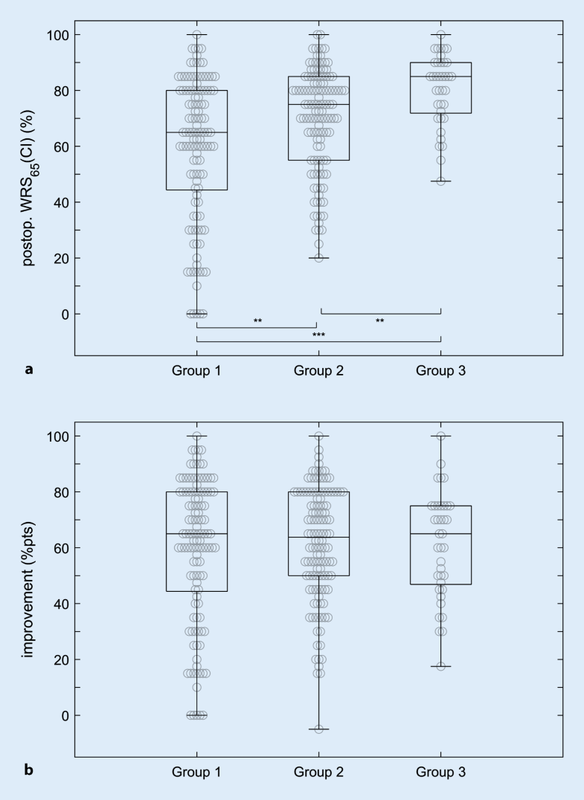 For the CI recipients in groups 2 and 3 with a preoperative WRSmax above 0%, we found a significantly higher postoperative monosyllabic score than for the recipients in group 1 with WRSmax = 0%. For patients with WRSmax > 0%, the postoperative monosyllabic score with CI was significantly correlated with the preoperative WRSmax. This correlation reinforces the interpretation of WRSmax as a measure of ICC . The ICC is limited by sensorineural pathologies. Since the WRSmax is measured considerably above the individual’s hearing threshold, it reflects, more closely than other audiometric measures do, the individual’s neuronal processing capacity. For 96% of the cases with a WRSmax above 0%, we found a postoperative monosyllabic score WRS65(CI) equal to or above the preoperative WRSmax. Consequently, the preoperative WRSmax can be interpreted as a lower limit (minimum predictor) for speech perception with CI after 6 months. For CI candidates with residual speech perception there is a residual risk of postoperatively decreased speech perception, even under optimum conditions . Therefore, the individual prognosis of postoperative speech perception is of special importance for patients in groups 2 and 3. Almost all patients with preoperative WRSmax > 0 had a WRS65(CI) that surpassed, or at least equaled, their preoperative WRSmax. 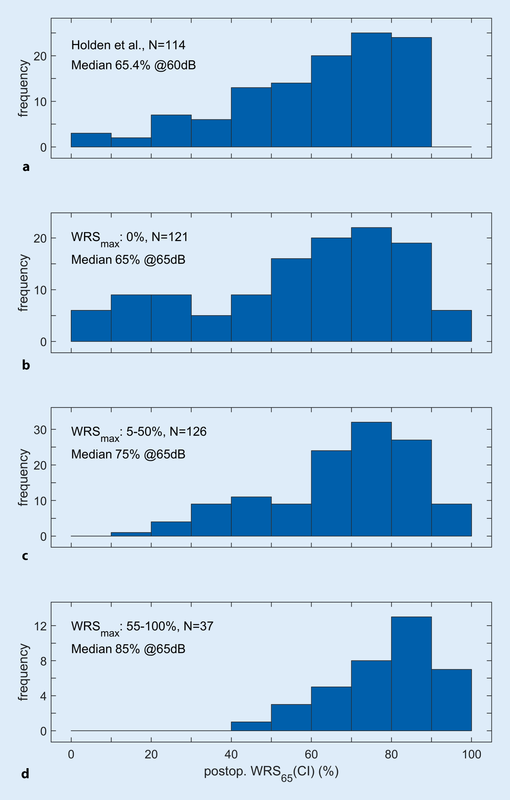 An advantage of the reference to the WRSmax and not to the WRS65(HA) is the distribution of the data: 60% of the CI candidates attained a preoperative WRSmax above 0%, whereas only 32% scored an WRS65(HA) above 0%. Additionally, WRSmax covers a range from 0 to 90%, allowing for a more finely differentiated description of the candidates’ speech perception capabilities than does the WRS65(HA), with a range from 0 to only 55%. Inherently, WRSmax cannot provide additional information on the postoperative speech perception of persons in group 1 (for whom WRSmax = 0%). However, this has little influence on the clinical decision, owing to the lack of alternative therapies. The postoperative speech perception scores of group 1 showed a large variability (Fig. 3b). This finding is in line with the results of other groups [2, 8, 17, 29]. A detailed comparison of the results of Holden et al. (; Fig. 3a) with those of this patient group without preoperative speech perception (WRSmax = 0%; Fig. 3b) shows a similar distribution of monosyllabic test scores with CI, despite the different examination conditions (6 vs. 24 months, 65 vs. 60 dB, Freiburg test vs. CNC). In group 1 it must be expected that a certain proportion (about 4%) of recipients will not develop monosyllable discrimination during postoperative development. Studies by Blamey et al. indicate a similar range (3–4%) for this proportion. The postoperative speech perception was significantly higher for the two groups with preoperative monosyllabic speech perception greater than zero (WRSmax > 0%) than for group 1. Therefore, our results support the current trend toward the treatment of patients with substantial speech perception . The improvement in speech perception with CI, by 65 percentage points, was equal for all three groups. This means that better speech perception with CI was associated with better preoperative WRSmax. This also supports a posteriori the provision of CIs to patients with high preoperative WRSmax, particularly in cases in which the maximum monosyllabic test score is far above the speech perception achieved with HAs at conversational level. In the present study this was the case for all patients with high WRSmax. Even though this study did not explicitly address the postoperative development of the WRS65(CI), this aspect did influence the study design. Thus, Krüger et al. reported an initially steeper growth of the WRS65(CI) with current CI systems over time than observed earlier in study populations. Furthermore, the results of Holden et al. show that 90% of the final (i. e., after 2 years) monosyllabic test score was already reached after 6 months. For this reason, we investigated the correlation between the WRS65(CI) after 6 months and the preoperative WRSmax in order further to minimize the variability. Future studies may investigate the influence of rehabilitation, motivation, communicative environment, and additional training measures [26, 29]. These variables are difficult to control for large patient groups and were therefore not taken into account in this study. This methodological consideration leads to the observation that speech perception scores may increase during long-term postoperative development, which in turn strengthens the potential of the WRSmax as a predictor of the minimum expected result. This affects the single case (Fig. 1b) where the postoperative WRS65(CI) was lower (by 5 percentage points) than the preoperative WRS65(HG). Here, a WRS65(CI) of 80% was achieved after 12 months. The incidence of such cases  emphasizes the need for a conservative minimum predictor. The WRSmax is a useful measure that may offer substantial support for individual CI counselling and treatment decisions. The preoperative maximum monosyllabic word perception, WRSmax, can predict the minimum postoperative speech perception with a reliability of 96%. Better preoperative speech perception yields better speech perception with a CI. In the patient group with a preoperative monosyllabic score above 0%, all CI recipients had at least some postoperative monosyllabic perception. The median improvement following CI provision was 65 percentage points. U. Hoppe works for a cochlear implant company (Cochlear Deutschland GmbH & Co. KG). The study was supported by Cochlear Research and Development Ltd. T. Hocke, A. Hast, and H. Iro declare that they have no competing interests. All procedures performed in studies involving human participants or on human tissue were in accordance with the ethical standards of the institutional and/or national research committee and with the 1975 Helsinki declaration and its later amendments or comparable ethical standards. Informed consent was obtained from all individual participants included in the study.